What an incredible game. 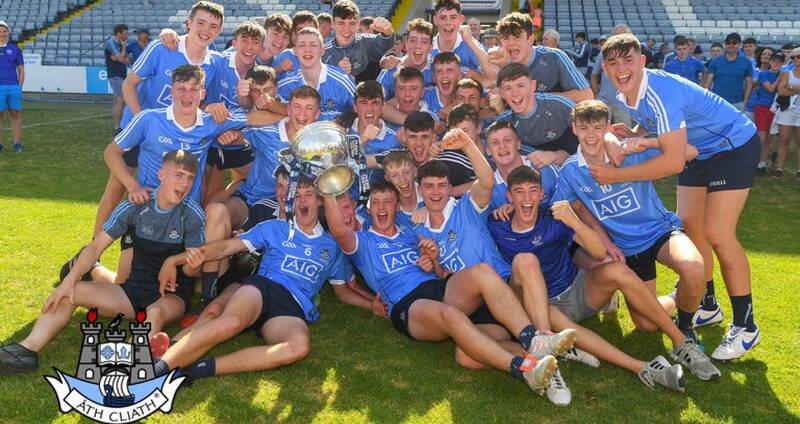 Dublin were crowned Leinster minor hurling champions when they defeated Kilkenny by four points in a thrilling goal-fest in O'Moore Park, Portlaoise on Saturday afternoon. Remarkably Dublin trailed by seven points inside six minutes following Kilkenny goals from George Murphy and Killian Hogan but then the young Dubs found their feet in spectacular fashion to score three goals in a two-minute spell. Liam Dunne, Luke Swan, following good work by Ciarán Foley, and Conor Murray all struck for goals and with Donal Leavy, Dunne and Murray tagging on points Mike Connolly's lad assumed the driving seat. However, Kilkenny rallied before the break and goals from Cian Kenny and Cathal O'Leary, late in the opening half, edged the black and amber into a 4-8 to 3-10 interval lead. Typical of this classic the pendulum swung back the other way on the restart with Dublin claiming goals through sharpshooters Liam Dunne and Luke Swan. Seven minutes into the second-half Castleknock's Luke Swan completed his hat-trick, his second of this summer's Leinster MHC and that also came against Kilkenny in the opening game of the Tier 1 round-robin section. On that occasion Swan also tallied 3-1 but the Cats were on the winning side of another high scoring thriller, 3-23 to 4-12. Last Saturday Dublin led by 10 points as the game went into the second added minute of injury-time with the Cats giving the Dubs a late scare with two goals, from Conor Kelly and sub Jack Buggy, to close the gap but the Dublin held on to lift the Hanrahan Cup as Leinster MH champions for the 16th time. SCORERS – Dublin: L Dunne 2-8 (0-6f, 0-1 ‘65’), L Swan 3-1, C Murray 1-2, D Purcell (0-1f), C Foley 0-3 each, D Leavy, P Christie 0-1 each. Kilkenny: Conor Kelly 2-3 (0-3f), C O’Leary 1-2, Cian Kenny, G Murphy 1-1 each, K Hogan, J Buggy 1-0 each, D Maher, C Brennan 0-2 each, E Guilfoyle 0-1 each. DUBLIN: J Lambert; K Byrne, E Carney, F Murphy; C Hogan, I Ó hEithir, A O’Neill; D Leavy, D Power; C Foley, P Christie, C Murray; L Dunne, L Swan, D Purcell. Subs: C Walsh for Hogan (22), S Fenton for Murray (44), A O’Toole for Christie (53). KILKENNY: J Brennan; J Young, P Dempsey, J Harkin; C Rudkins, S Staunton, H Walsh; D Maher, Conor Kelly; C O’Leary, C Brennan, Cian Kenny; E Guilfoyle, G Murphy, K Hogan. Subs: P Moylan for Walsh (ht), J Buggy for Hogan (42), J Morrissey for Guilfoyle (46), J Doyle for O’Leary (53), D Crehan for Harkin (60).